When the time comes to find a home for your online web presence, or website, the first question you need to ask yourself is which kind of hosting is right for you. In this particular post, we’re going to take a look at shared hosting, one of the most popular and cost-effective options for smaller businesses who don’t need a great deal of memory for their website. Shared hosting is an inexpensive hosting solution wherein different parties share a single web server to securely host their websites through a server that is maintained by a hosting company. Here, we’re going to take a closer look at that definition. Just like many service-based businesses, web hosting companies generally offer their customers a range of different plans, each tailored to meet different needs at different levels. For instance, web hosts typically offer three different types of hosting setups, including virtual private server hosting, dedicated server hosting, and shared server hosting. As a first-tier offer for hosting, shared hosting is typically the least expensive solution, and that’s great for small businesses. 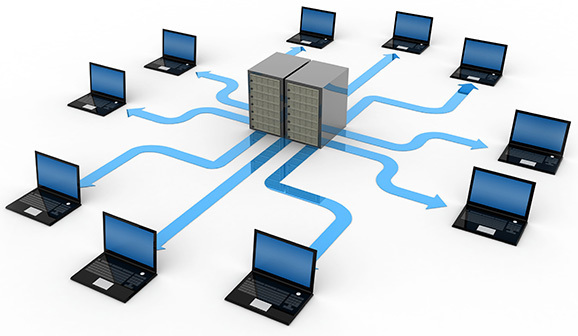 For this specific reason, shared hosting is the first solution for many business websites. It’s a place where you can get your feet wet online and start your path towards growth. The cost is lower because shared hosting trades off higher processing for higher volume. More accounts can fit onto a single server, and that means that maintenance costs are divided across a range of parties, driving the price down for customers. However, the problem is that while the price of shared hosting is low, the restrictions that are imposed on websites are high. When a hosting company remains shared, all the sites that are hosted use every resource on the shared server. This includes CPU power, bandwidth and memory. Under typical circumstances, this isn’t much of a problem. However, if one of the sites experiences a spike in activity, this can freeze or slow down other sites. Another problem of shared hosting is that you only get a small amount of support for each account. While you can purchase higher levels of support, since you don’t pay much at the basic level, you don’t get much in terms of help. It’s important to remember with shared hosting that although the server is shared, that doesn’t mean that anything else is. Each client that is hosted through a shared server can only manage and see their own site, and no others. Even though an email server might be shared, that email is only accessible by each party. With that being said, it’s worth noting that security is often a big concern on shared server. Simply because you’re on the same machine, you may find that it’s harder to ensure that your website is completely locked down. While many hosting companies handle this issue as best they can, it’s always a potential concern. Since a lot of parties exist on the same shared server, issues for security can lead to limited access at the back end of a server. Under shared hosting plans, much of the back end is completely locked down. A benefit of this is that maintenance is often managed by the web hosting company, which leaves you free to focus entirely on business. Unfortunately, this also means that you don’t have much control over your hosting server. Clients can’t install anything that isn’t provided by the hosting company, and while this is fine for most small businesses, it can be a problem as a company starts to grow and wants to add more functionality and solutions to its site. The hands-off maintenance and low price of shared hosting can make this option very viable for small companies that are just starting out, or plan to stay relatively small. The security risks for a shared server are higher, but it’s more of a situation that needs to be examined than an absolute show-stopper. As your business grows, the resources a website demands can grow as well. As more transactions and traffic continue to strain a server, it may be time to upgrade to a next tier option in your hosting plans.